How can I join DISCOVERY and is there a fee? Simply complete the online enrolment form. Membership is free. How can I join DISCOVERY and is there a fee? What brands participate in DISCOVERY? What are the different membership levels of DISCOVERY and the associated benefits? What are Local Brand benefits? Do you issue DISCOVERY membership cards? How can I view my account status? Why am I missing room nights from my account? Sometimes I see an ‘NA’ in the nights column of my past stays. What does this mean? What is the difference between eligible and ineligible stays and how would it affect me? I've forgotten my password. How do I retrieve or reset it? I am not able to log in to my account - what should I do? How do I earn status and awards? When are my tier nights credited to my account? Can I earn tier nights on stays made before I joined DISCOVERY? Do I receive tier night credits for "No Show" nights? How many rooms can I credit to my DISCOVERY account for the same stay? If two DISCOVERY members share the same room, do they both earn credit? What is a Local Experience? How can I earn a Local Experience? How do I redeem a Local Experience? Why does the 'Redeem' button not appear for me? How long does a Local Experience Award last? Must I have a valid stay at the hotel to reserve a Local Experience? Can I book a Local Experience when I get to the hotel? How do I cancel a Local Experience? Have a question? Please visit our frequently asked questions for further information. The DISCOVERY programme is envisioned to be a guest recognition programme like no other. Innovative and distinctive in its benefits, DISCOVERY will reflect the diverse cultures of the alliance and of its individual member brands. It rewards members staying at a GHA property with hotel benefits and Local Experiences to make each stay more comfortable and memorable. Simply complete the online enrolment form. Membership is free. Local Brand benefits are available to Black Level members staying at a hotel in the DISCOVERY collection and the types of benefit vary between brands, hence in essence it will not be the same in another brand. 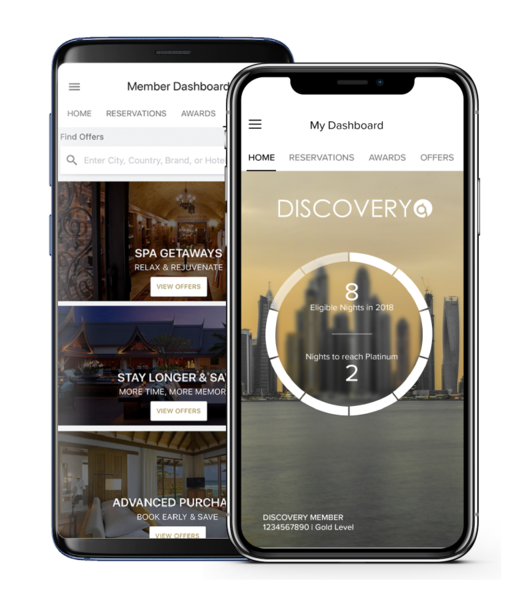 You are able to access an electronic version of your DISCOVERY membership card on your online account or the DISCOVERY mobile app, though your membership number is all that is needed for recognition on your next trip. You can view your account, check your profile, and edit your preferences by logging in to your Member Area. Third party online retailer rates, such as expedia.com, booking.com, hotels.com, orbitz.com, priceline.com, travelocity.com, etc. Furthermore, only the room nights spent at the hotels after you enrol into DISCOVERY are counted towards earning a Local Experience Award. This means that your stay has been recorded, but not validated yet for eligibility. Generally this can take up to 3 days. Information of eligible and ineligible room nights / stays are defined within the terms and conditions of the programme, but generally eligible room nights / stays will be accumulative towards your membership upgrade to the next level and the award of Local Experiences. Fill in your Username or Email address and click "Reset Password"
Check that you have entered your username or e-mail address correctly. Check that the e-mail address you have entered is the same as the one you used to set up your account (check your private email address and business email address). Check that the password you entered is the same as the one you used to set up your account (otherwise click on "Forgot your password?" on the Sign-in page). Should you require further assistance, please contact our DISCOVERY Membership Services. To ensure you earn tier status and Local Experience awards in the DISCOVERY programme we recommend you book your stays directly on the discoveryloyalty.com website, on our member brand websites, hotel direct or via traditional travel agencies. Your tier nights are credited to your DISCOVERY account between four and seven days after check-out for eligible stays in DISCOVERY collection hotels. No credit toward tier status will be awarded for "no show" situations when you have made a guaranteed reservation with a credit card but then do not check in - irrespective of whether or not your credit card is charged for all or any portion of the reserved stay. The rooms were reserved in your name. You were staying overnight at the hotel for which the multiple room booking was made. The stay under the same name takes place in the same hotel over the same period. Tier credits for individual travel only. Only one DISCOVERY member will receive tier night credits, regardless of the amount of DISCOVERY members in the room. A Local Experience provides you, as a member, with an opportunity to discover the world outside of your hotel. It provides a local twist to a favourite attraction at your destination or gives you access to an activity you wouldn't normally be able to do. By using our local contacts we provide unique experiences to enrich your stay and bring the discovery element back into travel. Local Experiences are authentic, unique and original and layer onto your itinerary to create a memorable stay. Membership renewals are issued in February following a full Membership year. More detailed information about ways to earn a Local Experience Award can be found here. You can redeem a Local Experience Award after logging in to your DISCOVERY Member account. Once you have found a Local Experience that you are interested in, click the ‘Redeem’ button (provided you have a Local Experience Award to redeem on your account). If you have multiple awards on your account, you will be asked to select the one you’d like to consume; it is suggested that you select the award that is closest to expiration. You should then enter the date when you wish to participate in the Local Experience and, if a stay is required at the corresponding hotel, enter the confirmation number for your reservation. After confirming your selections, you will be presented with a confirmation screen detailing the summary information and a confirmation email will automatically be sent to your previously provided email address. Please present a print-out of the confirmation email to the hotel upon check-in. If you are signed in using your DISCOVERY Membership information and do not see the ‘Redeem’ button available on a Local Experience page, it may be a case where you have not yet earned a sufficient Local Experience Award needed to redeem the Local Experience that you chose (i.e. a Platinum Local Experience Award cannot be used toward a Black Local Experience). Validity periods for Local Experience Awards differ according to their tier level. Platinum Awards are valid for 12 months and Black Awards are valid for 15 months. Selected Local Experiences require a hotel stay in order to participate; this will be indicated in the description. It is suggested that you first reserve your stay at the hotel, then redeem the desired Local Experience, in that order. This is at the discretion of the hotel. Some Local Experiences require time in advance for preparation as well as several weeks notice (i.e. select concerts and ticketed events). Please check the individual terms and conditions for each Local Experience. You can cancel a previously booked Local Experience by logging in to your Member account and selecting the ‘View My Account’ menu. Here you’ll see a list of Available, Reserved and Past Awards. In the ‘Reserved Awards’ section, click on the ‘Cancel’ button beside the Award you wish to cancel. Upon confirming this choice, you’ll receive a cancellation email and you’ll see that this Award is now listed within the ‘Available’ section of your account. Local Experiences are complimentary experiences designed by each hotel to reward loyal DISCOVERY members. However, there may be additional fees, such as a charge for additional people joining the experience, which will be noted in the description and/or the Local Experience Terms & Conditions. An enrollment in Select Guest® automatically includes and entitles the member to global membership benefits in DISCOVERY. Free nights are a benefit which is only earned and used when staying at Omni Hotels & Resorts. Free night certificates earned as a member of Select Guest can only be redeemed at an Omni hotel or resort.